After 70-plus years as a genre template, noir can feel a little played out at times, but that’s not to say it’s dead. Obviously, Ed Brubaker has found plenty to write about within the style and has done so beautifully. Weaker writers (and that would be most writers) have more difficulty finding the right balance of working within its conventions while pushing its boundaries. Saurav Mohapatra is no Brubaker, but he’s adding something new to the formula. 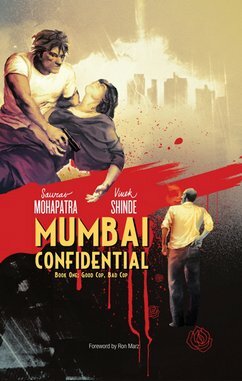 Mumbai Confidential takes place in India’s wealthiest, most populated city; a place of strivers, beggars, newly-minted capitalists, movie stars, and profound corruption. In other words, it’s kind of like the early-20th-century United States, but with cell phones. The city’s Encounter Squad provides the inspiration for the book. This special division of the police kills rather than books criminals, “Encounter” defining a situation in which officials are forced to open fire in retaliation/defense. It’s rich material, and although Mohapatra relies too much on gratuitous profanity and violence mixed with sentimentality, he also explicitly nods to conventions, like when his protagonist Kadam monologues while mocking the fact that he’s doing so. Vivek Laxman Shinde’s art veers between interesting and messy, resembling Gerhard Richter’s smeared photorealistic oil paintings. Some panels have lovely blurs in the background, just recognizable as human shapes, depicted in colors that catch the eye nicely. They’re even visually novel at times. Other set pieces feature twisted grimaces on faces, incomprehensible action, or spouts of blood that obscure movement in a failed attempt to titillate. It’s all a grab bag. The shorts that interrupt and bookend the main story are likewise all over the place. Some are focused, well-drawn, and illuminating. Some are not. The overall hash (not only the varying quality of the contributions, but also the rearranged chronology of the narrative) resembles Danny Boyle’s Slumdog Millionaire, and not just because of the setting. Both are magpies for ideas, more invested in throwing too much at a problem than in simplifying it, and although this tendency makes the result a sort of garbage salad, its provocations have a liveliness that saves the final product to a degree.